Poke /poʊˈkeɪ/ (Hawaiian for “to section” or “to slice or cut”; sometimes stylized Poké to aid pronunciation) is a raw fish salad served as an appetizer in Hawaiian cuisine, and sometimes as a main course. Traditional forms are aku (an oily tuna) and he’e (octopus). He’e (octopus) poke is usually called by its Japanese name “Tako” Poke, except in places like the island of Ni’ihau where the Hawaiian language is spoken. Increasingly popular ahi poke is generally made with yellowfin tuna. Adaptations may feature raw salmon or various shellfish as a main ingredient served raw with the common “poke” seasonings. 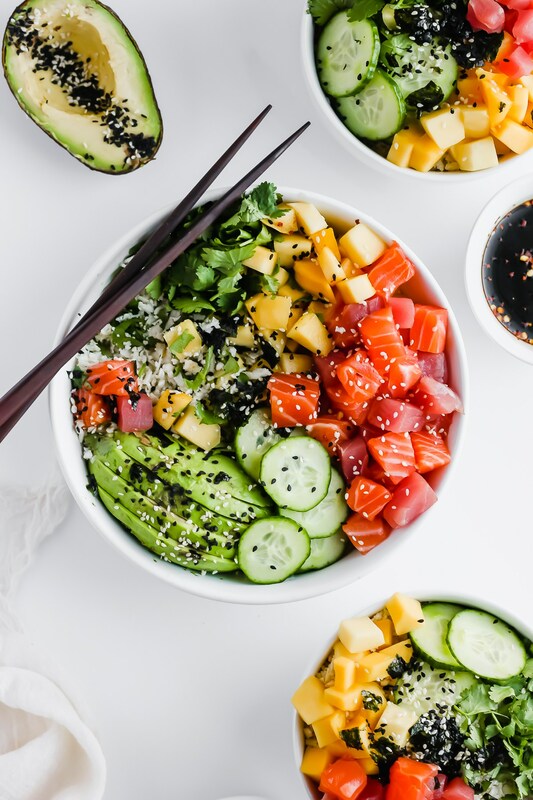 Poke began with fishermen seasoning the cut-offs from their catch to serve as a snack.Traditional poke seasonings have been heavily influenced by Japanese and other Asian cuisines. These include soy sauce, green onions, and sesame oil. Others include furikake (mix of dried fish, sesame seeds, and dried seaweed), chopped dried or fresh chili pepper, limu (seaweed), sea salt, inamona (roasted crushed candlenut), fish eggs, wasabi, and Maui onions. Other variations of poke may include cured heʻe (octopus), other types of raw tuna, raw salmon and various kinds of shellfish. Sushi grade yellow fin tuna, salmon and white tuna, seasoned Japanese rice, crunchy noodles, sweet pepper, red onions, cucumbers, avocados, other vegetables, white miso dressing and Kizami Nori. Fresh salmon, seasoned Japanese rice, crunchy noodles, sweet pepper, red onions, cucumbers, avocados, other vegetables, honey spicy mayo and sweet soy sauce. Within a 3 miles radius. Delivery charge $2.00 & up.